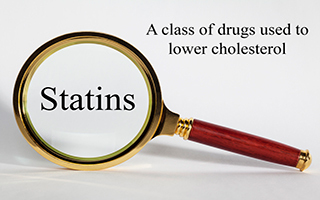 Statins do lower cholesterol. But they are not the wonder drugs that pharmaceutical companies would have you believe. They not only fail to prevent strokes and heart attacks, they also have serious side effects. It all depends on whether you're looking at the "absolute risk" or the "relative risk." According to a paper published in the medical journal Expert Review of Clinical Pharmacology, many reports of statins' effectiveness are using misleading statistics to exaggerate their benefits. The paper was written by Dr. David M. Diamond, a professor of psychology, molecular pharmacology, and physiology at the University of South Florida, and Dr. Uffe Ravnskov, an independent health researcher and cholesterol and cardiovascular disease expert. So the paper carries a lot of weight and getting attention from the medical community. The paper claims that "statin advocates have used statistical deception to create the illusion that statins are ‘wonder drugs,' when the reality is that their modest benefits are more than offset by their adverse effects." The absolute risk of a drug is the rate of beneficial and adverse effects on a population. Statins' absolute risk shows that the drugs benefit only 1% of the population. In other words, if 100 people take a statin, one fewer person will have a heart attack than if they had taken nothing. Of course, that's not a very compelling number. So instead, statin researchers report the relative risk, which suggests that 30 to 50% of the population benefit from statins. This doesn't take into account the negative effects that statins can have. And there are a lot of those. According to Dr. Diamond and Dr. Ravnskov, "The adverse effects suffered by people taking statins are more common than reported in the media and at medical conferences. Increased rates of cancer, cataracts, diabetes, cognitive impairments, and musculoskeletal disorders more than offset the modest cardiovascular benefits of statin treatment." In particular, the low cholesterol levels associated with statin use are associated with cancer risk as well. Most statin studies are short – too short to see if cancer risk increases. However, one long-term study found that women who took statins for more than 10 years had a significant increase in their breast cancer risk. Many health care and research leaders are calling for more transparency from the drug companies. They want records of adverse effects released, and they also are encouraging more journals to adopt stricter standards for authorship. The British Medical Journal requires that "clinical education articles will be authored by experts without financial ties to industry." Drs. Diamond and Ranskov hope that more journals will follow suit. We're all looking for a pill that will make us healthy, but when it comes to heart disease, the solution is making lifestyle changes: eat right, exercise, and reduce stress. You may be tempted to take a statin. Don't! Instead, try a good multivitamin, such as Healthy Resolve or a formula to lower stored toxins, such as PectaSol Detox Formula. You'll help keep your heart healthy without putting the rest of your body at risk.